A painting of Titti Trash in a rainbow dress on Cromer beach. 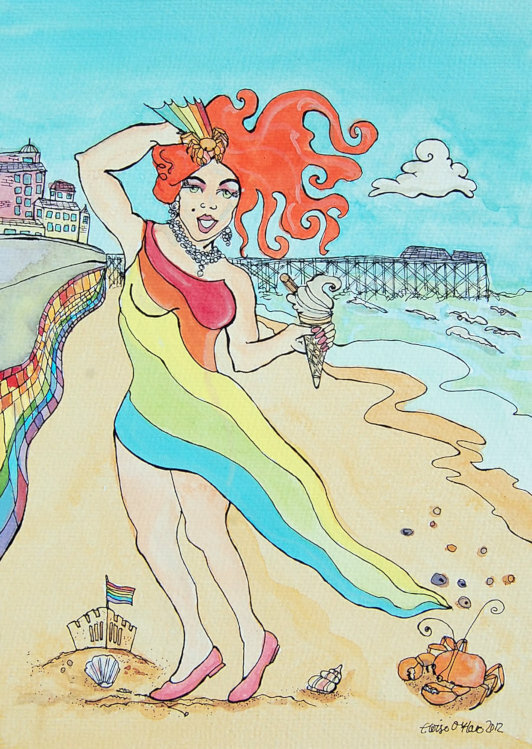 Titti Trash is standing on Cromer beach in a rainbow pride dress and with her signature red hair. In the background are Hotel de Paris and Cromer Pier, and the promenade is decorated with a very big and very long knitted scarf. The sandcastle and crab on the beach represents Norwich and Cromer, respectively. The painting was made in the year Titti hosted North Norfolk Pride.